In this Photive Hydra Gear Review I will share with you my almost 4 years experience with this cheap, lightweight, waterproof speaker. This was my first ever Bluetooth speaker and after a lot of research it became my first travel speaker. 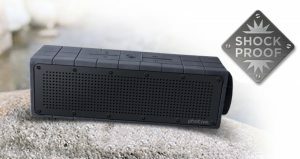 I purchased this speaker in the fall of 2013 for my first overseas backpacking trip and I continued using the Photive Hydra as my go-to bluetooth speaker until the spring of 2017. As a person who needs background music this provided me with the perfect amount of sound. After I broke my foot hiking in Turkey I used this speaker, for months on end, with my parents ipad to stream tv while I was healing. On one charge the Photive Hydra would provide sound for over 30 hours streaming! The battery life on this speaker is absolutely fantastic especially for the reasonable price. My initial Photive Hydra speaker survived rain, sand, drops and constantly being played at full volume for almost a year before the bass gave out. But a great thing about the Photive company was when I emailed them and told them what was wrong with the speaker they sent me a new one with no other questions asked. That’s some great customer service for an entry line bluetooth speaker. My new Photive Hydra speaker lasted me another extended trip plus time at home before it stopped charging, right before my 2017 adventure. 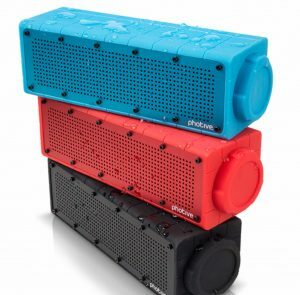 But honestly for the $35 price tag getting a couple years use out of a waterproof bluetooth speaker is still great. The Photive Hydra produces a whopping 80 dba’s of sound from it’s small size (7in x 2in x 2in). The sound is unidirectional and the quality is decent, it lacks a little in bass, which is understandable for the price. It’s fairly lightweight at 425g (15oz) and is very rugged with a full waterproof, shockproof and dustproof rating. The Photive Hydra has an ample amount of buttons so you do not need your phone next to you to control the music. You have a play, pause and disconnect button, along with volume controls and previous and next buttons. To turn the Photive Hydra on and off along with charging you have to remove the end cap and from there you can also plug in an aux cord. The battery life is rated for 8 hours but with my speaker I easily got 10 hours at loud volume and close to 30 with low volume. 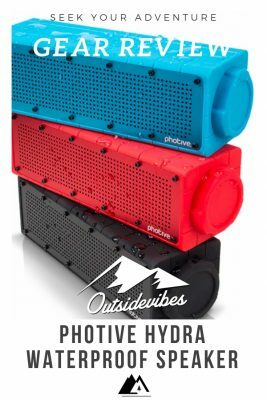 For a full waterproof bluetooth speaker that will not break the bank the Photive Hydra is what you need. 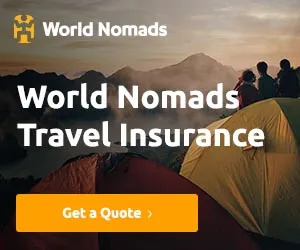 It is small and lightweight enough to take backpacking and you will not have to worry too much if it gets stolen or broken. 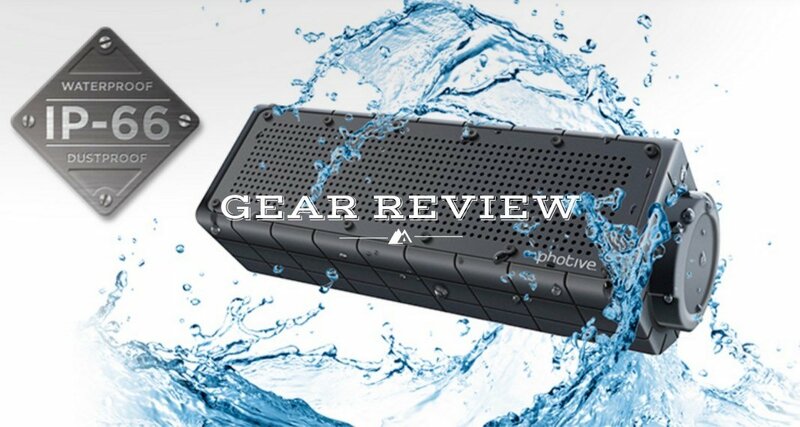 I hope you enjoyed my Photive Hydra gear review and If you are in the market for cheap an all around bluetooth speaker this is the one for you.